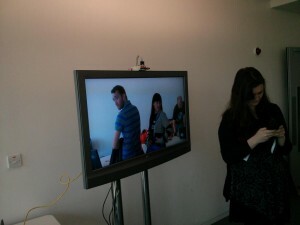 At Oggcamp I set up a big TV with a Pi and camera taped on top. I SSH’d in to the Pi from my laptop and entered commands in to iPython using picamera. Speaking as an avid Pythonist, picamera’s implementation is beautiful and it really is a wonderful library to use. It works really well for demonstrations using the Pi camera, and for real world applications. Part of the appeal of the Raspberry Pi is that you can work on embedded electronics projects without needing to know low-level languages or have to program a microprocessor – instead you have the choice of a range of accessible high-level languages such as Python – and this is an extension of that kind of abstraction, which open up a world of possibilities to a wider diversity of makers. and watch the preview flow through the brightness levels. The library has many configurations – you can change the brightness, contrast, saturation, image effects, exposure modes and such, as well as optionally show a live preview of the camera’s view. 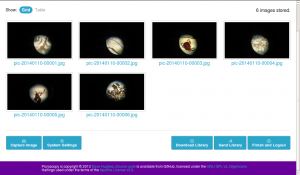 You can capture single images and sequences of images as well as video streams. Dave’s wife Holly works in the Palaeontology department at Manchester University (Interesting fact: when Dave and Holly got married, they picked a new surname to take (Dave was previously a Hughes) – so Holly could become Dr. Jones, and he would become Davy Jones) where they regularly capture images from microscopes. Rather than mount a huge camera on top of a microscope, Dave suggested attaching the Pi’s camera module to the lens. He ended up writing a web app to support its use. 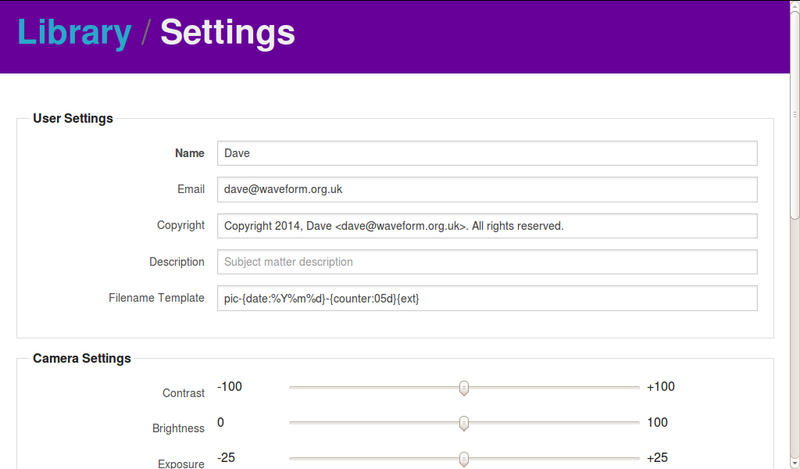 This allows the user to control camera configuration settings through a web page, and capture photographs at the click of a button, as well as archive pictures taken in to a database along with metadata and extra information entered in a web form. This is where having a library is particularly useful. If we were doing this with, say, raspistill and raspivid, when you want to alter the brightness of your preview, you’d have to shut down the program, regenerate the command line, restart the program. Here we’re just saying “set a property”. This is why a library is better for an interactive application like this. There’s nothing wrong with raspistill and raspivid as far as they go, but they’re not ideal for building this sort of application. If you have interactivity, you want a library. See more videos from the Manchester Jam: Jam #16 Videos. Dave also mentioned to me that this is by far the most popular project he’s ever published – and he’s been impressed by how brilliant the feedback has been from the Pi community. He’s had a great response on the forums, detailed bug reports provided by users and plenty of help from James Hughes, the author of raspistill, and from Alex Bradbury in getting it packaged for Raspbian. 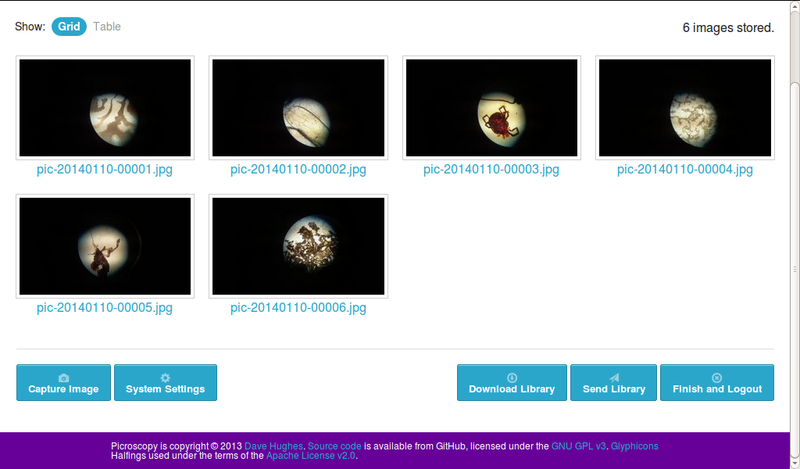 See the source for picamera and the picroscopy web app on github. Thanks to Dave for his hard work in building this library. Enjoy! What else does he have in his locker ? Perhaps he can give some further examples of his monkeying around ? I look forward to using this with my Pi Camera attached to my bird watching scope. At the moment the only thing on github which I’ve used picamera for is the picroscopy project (which Ben linked to at the end of the post). However, the docs contain a fairly extensive “Recipes” section, and there’s been some interesting snippets of code in the the forum post (including a rudimentary bit of motion detection using numpy!). 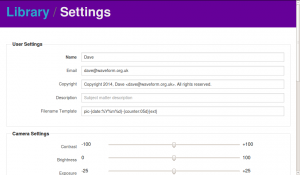 Brilliant stuff – no more tedious mucking about with os.system – thanks Dave! Hey. good job. Can I use the same for USB Web Cams ? Or Is there any other pure python modules for accessing USB Web cams? I’m afraid picamera’s purely focused on the Raspberry Pi’s camera (under the hood it uses libmmal, just like raspistill and raspivid so it’s similarly specific in the hardware it’ll handle). That said, there’s plenty of Python interfaces for dealing with USB webcams – OpenCV has an interface for dealing with them, and there are Python bindings for GStreamer (which is a bit more complex but allows you to build whole image processing pipelines). Shall try this out as soon as I get a chance, was after something like this a few months ago (although may be useful still…). Q: Is the preview friendly with tkinter? i.e. is it possible to embed it within a tkinter frame/canvas? I’m afraid not. The preview is written directly to the screen (there’s not much I can do about this I’m afraid; that’s just the way the camera’s preview system works). That said, you can configure the position and size of the preview so if you could react to window positioning and sizing events you could move the preview to within the window’s borders. No problem, I half expected that to be the case. For my purpose a basic work around is fine. 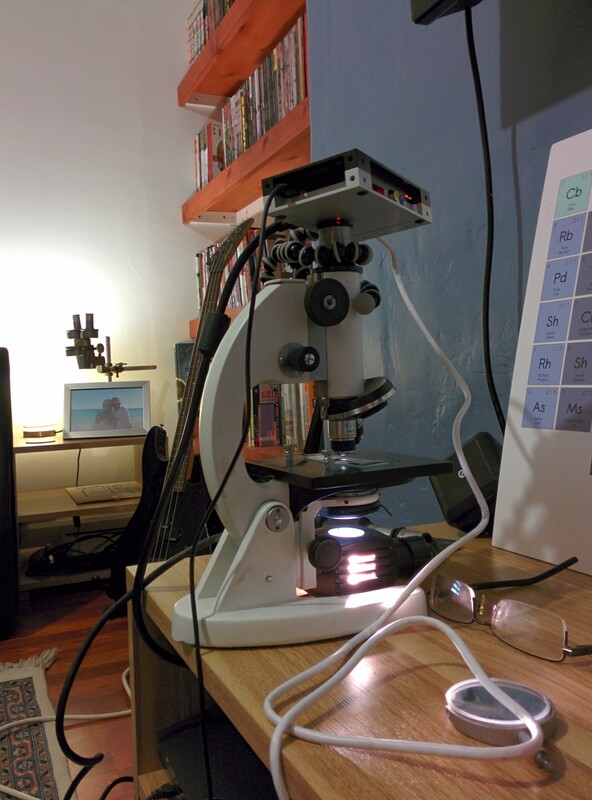 I like the Microscope + Raspberry PI + Camera idea, the commercial ones starts at 200$. If we can connect Motor controller and able to adjust the lens that will be awesome project. 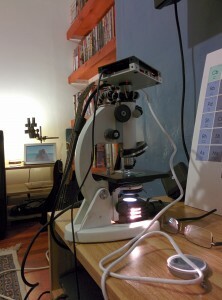 Looks like the Microscope + Raspberry Pi Case has the option to add the camera module, wonder where can I get that one? The case I’m using in the photo is the “Proto Armor for Raspberry Pi and Camera”. It’s rather expensive, but at the time it was the only case I could find that housed the Pi and the camera module, and provided a tripod attachment (which combined with a gorillapod makes it great for demonstrations). 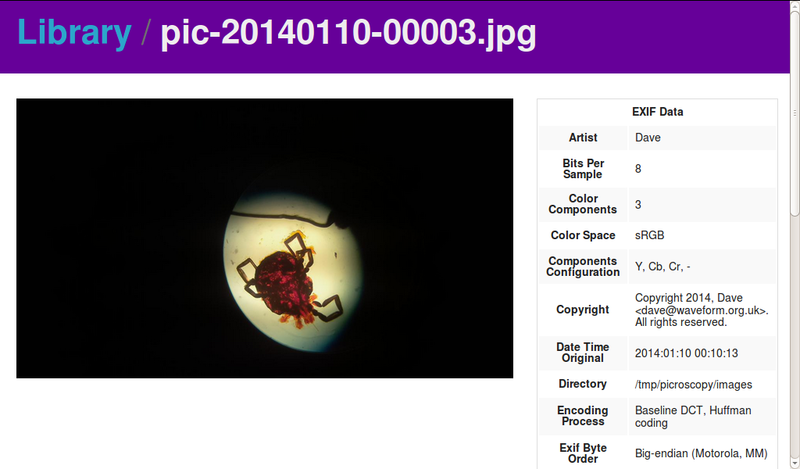 However, as can be seen from the images, it’s not that great for mounting on a microscope. For that I’m betting more on something like Dave Cox’s superb Picroscope mount. Unfortunately, as noted on that page, this’ll involve replacing the lens – thankfully Santa bought me a PiNoir this year, which’ll come in handy as a backup in case I trash my camera module! Does it able to do live streaming of the camera on a browser? the raspberry pi becomes a bit difficult to handle when it has an HDMI cable attached. It’s much easier if it can be run headless. This would be particularly useful for using it with a telescope. It *might* be possible to take a video feed from the camera and render it in an X window but it’d probably chew up quite a bit of CPU. The camera’s preview window, however, is rendered directly to the screen (it just overlays whatever’s there – there’s not much I can do about this; it’s just how the camera’s preview works). That said, you can control the position, size, and transparency of the window, so a crude workaround (suggested above) is to react to window position and sizing events and position the preview accordingly. Logistically I cannot attach a monitor to the RPi. One thought I had was to attach a WHDI device to the HDMI port: something like the Nyrius ARIES™ Pro Wireless HD for Laptops NPCS550. But before I spend money on that I want to see if Raspicam Remote can give me an adequate streaming preview on my smartphone (The video loop feature in Picamera will probably help me get over latency issues). If I change the resolution of the Picamera Preview does this also change the resolution of the recorded image on the RPi? Ideally I want to be able to reduce the Preview resoution so that Raspicam Remote can handle the data but I want to record photos/video on the Pi at the highest resolution. Could the processing power of the smartphone (HTC Desire) also be a consideration I will need to make ? The quickest way to get live streaming (at low-res) to a browser is RPi Cam Web Interface http://www.raspberrypi.org/phpBB3/viewtopic.php?f=43&t=63276 which could probably also be re-written using the Python library, if you wanted to. Interesting question. I’ve got one of texy’s mini-tft touch-screen displays (which looks similar to the pitft and runs off the GPIO as well), but I must admit I haven’t had the opportunity to try out the camera preview on it yet (mostly because it requires custom firmwares, and I’ve been closely following the main firmware for all the camera fixes that’ve been landing). However, I can say that the preview doesn’t care about the frame-buffer – I think I’m right in saying it just gets the GPU to render over its output. It’s certainly it’s possible to start the preview without anyone logged into the console at which point access to the frame-buffer would usually be limited to root, so I don’t think it’s involved at all. All that leads me to suspect it won’t work, but I won’t know for certain until I give it a whirl! AttributeError: ‘module’ object has no attribute ‘Picamera’. This is interesting – I was just reading through the code for adafruit’s awesome little camera project (http://learn.adafruit.com/diy-wifi-raspberry-pi-touch-cam) where it appears they’re using a PiTFT touchscreen in the way you describe. However, having dug into the code they’re not using the preview functionality to render to the screen – instead they’re doing rapid video-port-based raw captures, and using pygame to render them. My guess is this is partially because preview may not work on the PiTFT, and partially because this allows them an easy way to render their user interface over the top. Still, it’s a great demonstration that the camera can be made to work with such a screen, and rapidly enough to be interactive. Serendipitously, I hit the publish button on a post about that very project about ten seconds ago – check out http://www.raspberrypi.org/archives/5773! Good stuff. 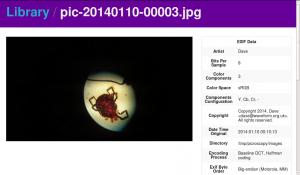 Did you have to modify the camera or microscope at all, eg. remove lens/eyepiece ? Is it possible to take photos, triggered by an external hardware clock pin, and collate them as a video file at a set bit-rate? I’m thinking something along the lines of stop-motion animation. Absolutely – you can have it capture pictures in response to … well … whatever you can code (which given the Pi’s GPIO pins means just about anything!). The library itself provides no facilities for collating images into a video file, but ffmpeg will do that quite happily (see http://hamelot.co.uk/visualization/using-ffmpeg-to-convert-a-set-of-images-into-a-video/ for an example). For long sequences, I’d recommend doing the video conversion step on something with a bit more ooomph than a Pi, unless you’re particularly patient! Being a python beginner, how can I find the bits that matter in picamera.PiCamera(), like camera.rotate – or is it camera.rot? Forgive me, I did see a way somewhere to find these (some form of help command, but lost my notes). As to the case, would a Pice be an easier fit to the microscope? The API reference in the docs lists all the available properties and methods of the class. Alternatively, if you want to interactively explore the library on the command line I’d highly recommend installing ipython (sudo apt-get install ipython) and using that instead of the regular python interpreter. The ipython interpreter adds tab-completion (which is great when you can’t remember whether it’s “rot” or “rotate”) and easier doc-querying (append ? to the property or method you want to view the docs for – you can do the same in the regular python interpreter by wrapping the method or property in a help() call, but the ipython way is much more intuitive once you’ve used it a couple of times). Thanks for the mention of the Pice – I hadn’t seen that before, and it certainly looks like a nice camera-integrated case! You can’t install two things simultaneously. Thanks for an excellent piece of technology. An as i think, TECHNOLOGY is one of the very few thing that define human advancement. After I had previously also been problems with Python 3 (import cv2; jpeg in tkinter …), this was crucial for me to switch completely to Python 2. I can’t seem to reproduce this with picamera 1.2 on python 3.2 under Raspbian. If you’re still having the issue, please feel free to open an issue on the GitHub site – I tend to monitor that more closely than this particular blog post. My apologies – I still haven’t found the time to properly document (or package, or even release) picroscopy. I’ll try and find the time to do something towards this in the next couple of weeks. If you do run into any issues, please feel free to file issues on the GitHub site for the project – I tend to monitor that more closely than I do this particular blog entry. nice job its awesome. but i want this to work with switches,how can i use switches in Picamera, can you pleas let me know..
It’s pretty easy – assuming you can react to GPIO events (with something like the RPi.GPIO library) then you can have the camera do something in response to GPIO events too. Firstly, I’d try and get a simple “print” statement working in response to a GPIO event, and then just replace the “print” statement with a capture() call, for example. can u just let me know how to disable auto white balance , what command is needed for that . Basically, it’s out of my hands at the moment (it’s a problem common to raspistill, raspivid, and picamera – or any camera client for that matter – we’ll just have to wait for a fix upstream). great job, it’s really awesome. I’m working on install PI on board a drone, with camera module managed with two axis servos, also connected to PI. I’m currently writing a python server socket that run on the PI side to control it, and should use also your picamera library to remote control image and video recording. What i’m trying to do is streaming the video preview in low quality on socket and eventually (on received command) record video in HD on PI local file. From your point of view how could I address that? May it be possible? I want to that Raspberry Pi can do Real time streaming and Video recording at the same time. My toy has it, and I control moving of toy using smart phone. It connected through WiFi. and I can see streaming video in real time using smart phone. So, I’m studing Python Recipes of Picamera. But I can not implement that Raspberry Pi can do streamig and recording at the same time. Please commant and make recipe for [mjpeg-streamer] and recording at the same time for making my Toy. Loving the PiCamera interface to the Pi Camera. I’m using the camera together with the PiFace Control & Display module, and I can trigger a video stream on demand from a button press (interrupt-driven), but stopping the video stream on demand is another matter. While the stream is active (camera.start_recording …) interrupt processing appears to be held (i.e. the interrupt is processed only after the call to camera.stop_recording). I’d like to be able to designate a button to Stop the recording, but if interrupts are held then I have to poll the button status, forcing me to wake the process every half-second or so. Is there a way to receive the button interrupt during the camera.wait_recording() call? We have an application where we want simple button controls overlaying the full screen live video. This should be straightforward in Python if we could associate video with the parent frame. However, from reading your comments it sounds like your library directly overwrites whatever is on the screen – correct? This will make it difficult to have control buttons on top of the live video. Any comments or suggestions on how we could accomplish this? Use dispmanx – search the forum for more information. Please post any technical questions in the forum where they will be seen by more people who may be able to answer your question.